The village of Great Barford is situated on the river Great Ouse, to the east of Bedford, in rural Bedfordshire. It has a population of around 2000 and is twinned with Wollstein in Germany. 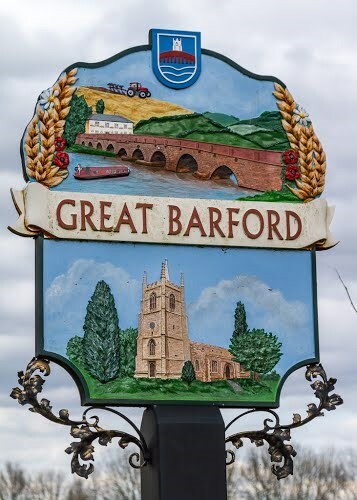 Mentioned in the Doomsday book, Great Barford was an important site, probably as a means of crossing the river, the area of the original ford was dug up in 1973 and a bridge has been here since at least the 15th century. Today the bridge, with its seventeen arches, spans the Great Ouse and acts as a gateway to this lovely village . The sign depicts village life including the river, the bridge, a riverside hostelry, All Saints' church and farming. Both sides of the sign appear to be smilar. Near the sign is a hexagonal bench, with text carvings on three sides. Simply count up the number of times the required letters are carved and insert them in to the equation. Congratulations to MarcusMaximi on being First To Find.